Even a smooth-running day of operations can instantly turn into one of time- and resource-taxing challenges. Finding ways to quickly and efficiently get operations back on track is crucial to the success of your business. 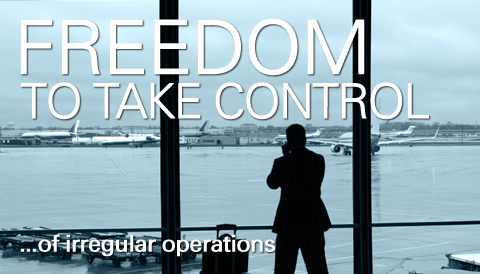 With our solutions and expertise, airlines can quickly and efficiently get operations back on track. Download your free efficient operations InfoPac today! Create alternatives for flight delays, cancellations, equipment swaps and diversions and effectively recover from a flight schedule disruption with Sabre® AirCentre™ Recovery Manager proactive planning capabilities. Facilitate rapid situation response and resolve schedule, passengers, aircraft, crew, maintenance, airport gates and staff disruptions. Recovery Manager provides integrated recovery approach minimizes the overall impact of disruptions to your airline’s operations. Simplify and automate the process of rebooking passengers affected by disruptions while minimizing the overall cost impact with our automated reaccommodation solutions. The IROPS Reaccommodation solution from SabreSonic® Check-In can assist prior to and during day of operations. Better plan and execute integrated operational disruption strategies that yield ways to increase efficiency, reduce related costs and deliver a superior customer experience. Contact us today to learn how we can help improve your operations today and into the future. Download your InfoPac and receive information on new or improved ways to enhance operations communication and coordination.